Today is National Agriculture Day, and I have never been more proud to be a farmer. It is also the first day of spring, but here at AeroFarms, just a short ride from NYC in Newark, NJ, we are growing exceptional produce, all year round, rain or shine. And we are growing a lot more than food. At AeroFarms, we grow insights. We solve problems. We nurture curiosity. We have brought together an incredible group of passionate change-makers, from engineers, inventors and scientists, to mathematicians and nutritionists — intellectually curious minds with insatiable appetites to find solutions to some of the most important problems of our time. The inspiration to co-found AeroFarms in 2009 came from my work with Bill McDonough, the co-author of Cradle to Cradle and a champion of our environment, and from my time on the Global Water Task Force for the World Economic Forum and the profound appreciation that water is our most precious resource. 70% of our earth’s fresh water goes to agriculture while 70% of pollution in water comes from agriculture. Therefore, in order to solve water, we have to solve agriculture. Agriculture is one of the most important industries in the world today. Yet, agriculture’s overwhelmingly positive impact on humanity also comes at a great cost that is rarely captured in the price you pay at the register. Traditional field agriculture is a larger contributor to global pollution than the oil and gas industry. This is hardly surprising given the negative externalities found in the supply chain of traditional agriculture. Overuse of pesticides and fertilizers, degradation of healthy soil, transporting water great distances to farms, shipping produce thousands of miles across the country where it often spoils before being eaten — these are all just some of the hidden environmental costs that are exacerbated as we hurtle towards 9.5 billion mouths to feed by 2050. If we want to live on a healthy and thriving planet, we must fundamentally change the way we think about the future of food and agriculture, and we have to start now. In the US, the average age of a farmer is 57, and many of their children will not stay on the farm. Globally, farmers face numerous macro tensions including extreme weather events, pest outbreaks, soil contamination, water scarcity and the spread of pathogens (think E.coli, salmonella and listeria) that cause havoc for their businesses and add risk to our food supply-chain. It’s not uncommon to see empty shelves in the fruit and vegetable aisle of your local supermarket due to supply issues caused by these realities. AeroFarms Global Headquarters, located in Newark, NJ. Although we face many challenges, I feel incredibly optimistic about the future of food. More than ever before, consumers not only want to know where their food comes from but also how it was grown and how it got to their plate. Was it cultivated responsibly? Were pesticides used? Were workers treated ethically? There can be no doubt that this type of consumer awareness and behavior is not a fad, but a meaningful shift in consumer consciousness. At AeroFarms, we are engaging in pioneering work as we strive to produce more with less precious resources. With the environment in mind, we can grow with 95% less water and as much as 390 times more productivity per square meter than traditional field farmers on an annualized basis. While some try to modify a seed to match the environment, we modify the environment to match a seed. Our method of growing gives us the ability to maximize taste, texture, appearance, shelf-life and even nutritional density. In the spirit of driving sustainability through industry collaboration, we partner with great companies to accelerate the development of sustainable, responsible food systems around the world that will have wider applications throughout the industry. An example of these partnerships is Dell Technologies as we are working together to manage the important data side of our farms. We celebrate that AeroFarms story is just as much about its technology and positive environmental stewardship as it is about its social impact. As a Certified B Corporation, we have worked diligently with our local communities to create jobs and growth as we combat food deserts and democratize access to fresh, nutritious produce. We serve as an example of what public-private partnerships can achieve when parties are committed to raising performance standards and investing in innovation. 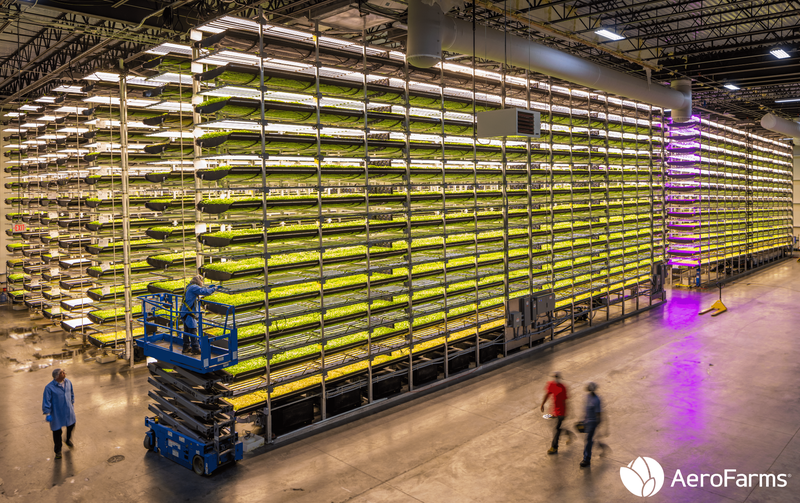 There has never been a more exciting time to be part of an industry where catalytic organizations like AeroFarms and others are revolutionizing our food paradigm. I would encourage anyone who is committed to food security for the sake of future generations to join our movement. I invite you to follow AeroFarms’ story and engage in our journey as we work towards a more sustainable future.